September is Heritage Month in beautiful South Africa. It’s Heritage Day in the historic frontier City of Grahamstown where, in terms of heritage, we seriously are spoiled for choice. The heritage of our indigenous peoples is very rich. Rich in ancient roots, rich in traditional cultures and rich for being the time proven vanguards of these lands. The heritage of our European Settler descendents is very rich. Rich in terms of Victorian architecture erected on African soils, rich as trail blazers for Western education and medical care, and rich from their commercial, legal and agricultural enterprises from their colonising days until 1994. The heritage of the Golden people, also known as the Coloured people, is very rich. Rich in their incredible gene pool, rich for their deep global and indigenous roots, and rich for their prowess as comedians, priceless sense of humour and quick wit. The heritage of our Indian, Pakistani and Bangladeshi citizens is very rich. Rich in their fidelity to their religions and cultural customs, rich for their remarkable business acumen and rich owing to their extraordinarily low labour costs. Cosmopolitan academics range from pre-schoolers to acclaimed Rhodes based/related professors so we are alive and kicking in our diversity, all loving our precious mutual heritage of clean air. What has impressed me keenly about our common natural heritage on this glorious hot day is our amazing heritage of flora. The jasmine is pouring out the last of its sweet scent and the streets of our little suburb are alive and fecund with orange flowers! Strelitzias and clivias are ablaze everywhere. Likewise hedgerows of delicate orange blooms whose name I have to find. 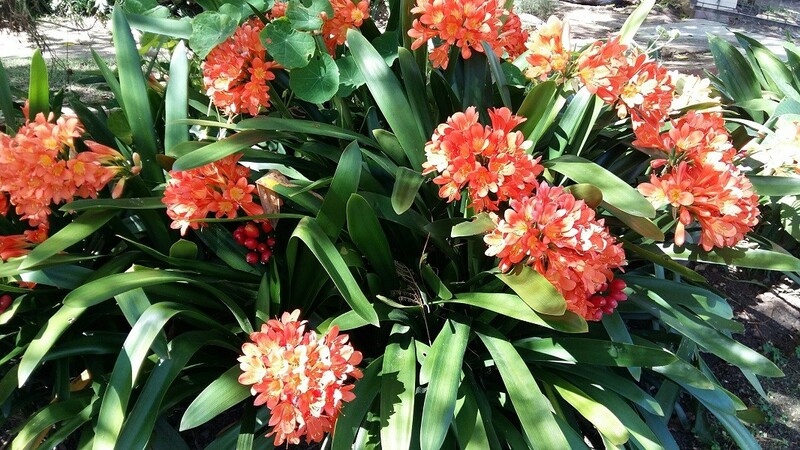 Aloes of every variety are flashing their long living different orange candles. Eryphrinas or coral trees line streets, dense with their heavy, vivid flowers. California poppies spring up in suburban gardens, as do nasturtiums, zinnias, marigolds and the orange majority of kannas. Soon the Australian Rain trees will be in full flower and Somerset Street will be a riot of large orange shower-shaped beauties. Spring is but a whisper in the South ... and with Grahamstown being the confluence of four climatic zones, she announces herself with jasmine in July and for three months thereafter lurks in between very cold spells of windy, rainy days. After a bleak winter, we have been impatient to be warm again. T shirts, jeans and cotton dresses beckon from the wardrobe as do sandals. Spring is only official when we can walk barefoot and feel the earth beneath our soles, initially somewhat tender from a long winter in booted socks. Heritage Day 2015 has been a gift of a perfect day. Sun washed, the trees are green again, the grass is longer, people are smiling more. Spring has whispered ... summer is shouting loudly around the corner! This afternoon, our children gathered orange floral bounty to beautify our home. Magic last days of our very orange spring!